Elm Coffee Roasters is a relatively new addition to Seattle’s excellent speciality coffee scene, having only opened in December 2014 and celebrating its six month anniversary not long before my visit in the summer of last year. On 2nd Avenue in downtown Seattle, it’s very close to King Street Station, which makes it the ideal spot to start your coffee tour of Seattle if arriving by train or bus. Which I did, Seattle being the last stop of my coast-to-coast journey that had started in Portland, Maine. And I didn’t go, because I forgot to check my phone and didn’t realise how close Elm was when I got off the train! And I’m still kicking myself even now, nine months later. It’s not just that Elm is a beautiful, large, uncluttered sun-drenched space and an amazing location for a coffee shop. It’s also a roaster, with all the coffee being roasted in the Probat at the back of the store, in plain view for all to see. In that respect, it’s like Stoked Roasters + Coffeeshop in Hood River, or, for UK readers, Birmingham’s Quarter Horse Coffee. Best of all is a coffee menu that lets you try absolutely everything! I’ve been told that Elm Coffee Roasters, on 2nd Avenue, is in a slightly dodgy part of town, in as much as anywhere in downtown Seattle is dodgy. Perhaps run-down would be a better description. Or up-and-coming. Regardless, I felt perfectly safe there. A lovely space, with really high ceilings, it’s perhaps three times as deep as it is wide. The front’s all windows, a glass door on the left, flooding the interior with light. There are two tables at the front, then there’s a massive space to the counter which takes up most of the left-hand side. Directly ahead of you is the retail section, after which there’s the cake and then the till, where you order and collect your coffee. At this point, you’ve made it maybe one-third of the way along the counter. Beyond this point, there’s a projecting stone top and nine bar stools. You have a choice: sit by the espresso machine, the grinders (the best spot to natter with the baristas) or up by the kettles/jugs. Opposite the counter, a long wooden bench with six two-person tables runs against the right-hand wall. And, as far as seating goes, that’s it. However, the best is yet to come. At the back, where the counter/bench stop, there’s a low, wooden counter with a glass barrier along the top, dividing coffee shop from roastery. A lovely Probat sits splendidly for all to see, along with sacks of green beans and a complicated exhaust/ventilation system. Personally I think Elm’s missed a trick: I’d have a bar on the customer side so people can sit and watch the roasting (sadly the roaster wasn’t in action during my visit). On the other hand, when Elm first opened, there was no glass screen, and the roaster was being interrupted too often, so perhaps it’s for the best that there’s no seating back there. As well as the windows at the front, there are two large windows on the right at the back, making it a very bright space. The dark, wooden floor, and exposed-brick walls at back/on the right, make an interesting contrast with white-painted walls/ceiling and light, wooden counter. Elm has its Nine Swans seasonal blend on espresso, along with a single-origin, while there’s also bulk-brew filter (Elm’s considering doing hand-pour). During my visit, the same single-origin, an Ethiopian Deri Kockoha, was on espresso and filter. The menu has multiple tasting options, including “One of Everything”: espresso, macchiato and filter for just $5. I couldn’t resist! Having had the Nine Swans at Street Bean Coffee earlier on that day, I selected the single-origin. As an espresso, it was a little fruity for my palette, but not unpleasantly so. I preferred it in milk, but felt the fruitiness still came through a little bit too strongly. It was best as a filter, where the fruity notes really exploded as it cooled. Interestingly, Elm pulls its espresso very differently depending on the bean. The Nine Swans had an 18g dose (36g out), while the single-origin was much longer (20g in/50g out). I finished up with a decaf cortado. The decaf having great flavour and punch, coming strongly through the milk, although I felt it struck a slightly discordant note. The milk was superbly steamed, holding the latte art to the very end. 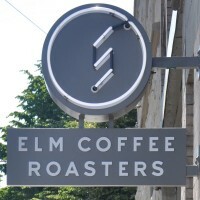 This entry was posted in Cafe/Roaster, Cake, Coffee Shops, Evening Opening, Roastery, Seattle, Stations Nearby and tagged Elm, include, PortlandPortland2015 by Brian Williams. Bookmark the permalink.